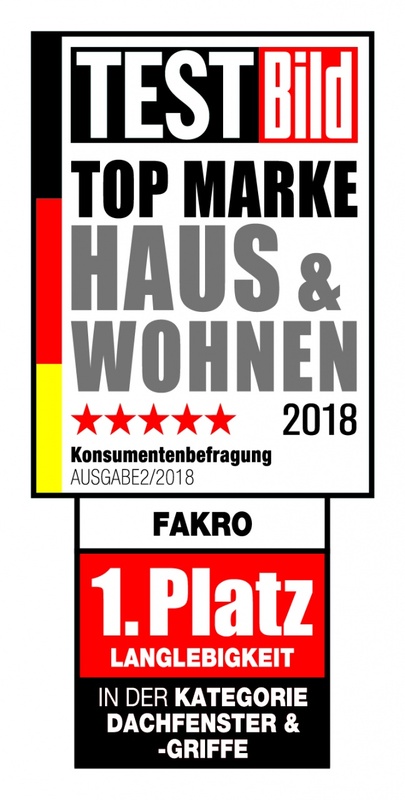 FAKRO, the vice-leader in the global market of roof windows is TOP MARKE HAUS & WOHNEN 2018 according to German statistics company Statista and TESTBild magazine. FAKRO won the 1st place in the category „Roof Windows & Handles“ for their lifetime. The quality of FAKRO products was appreciated by thousands of German consumers. TESTBild has successfully established its position as a new magazine available on the market. It provides transparent tests and gives clear purchase recommendations. TESTBild offers valuable product information for all areas of life and helps make the right purchasing decision in the „jungle“ of brands. Top brands were chosen by 5,336 people in seven main categories, including: Exterior Buildings-Extensions & Safety, Tools, DIY, Bathroom & Wellness, Heating & Temperature regulation, Furniture, Home accessories & Textiles. Then, respondents selected „Top 5“ brands in 85 subcategories. FAKRO products were appreciated and won the 1st place in the „Product Lifetime“ category, proving better than other nominated manufacturers of roof windows. FAKRO is one of the world’s leading producers with an estimated 15% global share of the roof window market. Its products are available in more than 50 countries. The company aims to supply the highest quality products to satisfy the requirements of the customers all over the world. That is why FAKRO places the highest priority on health and safety, security and the environmental impact of its products. Quality system functioning in the company integrates all activities in order to always provide high quality products in accordance with customer’s expectations, requirements of European standards and various certifying bodies. Additional confirmation of high quality products is having more than 20 prestigious certificates within which regular, external control audits are held. FAKRO’s research and development department consists of more than 100 engineers, whose ideas are converted into innovative solutions and new products. FAKRO is also the author of over 160 patent applications and is renowned as one of the most innovative companies in the roof window sector.